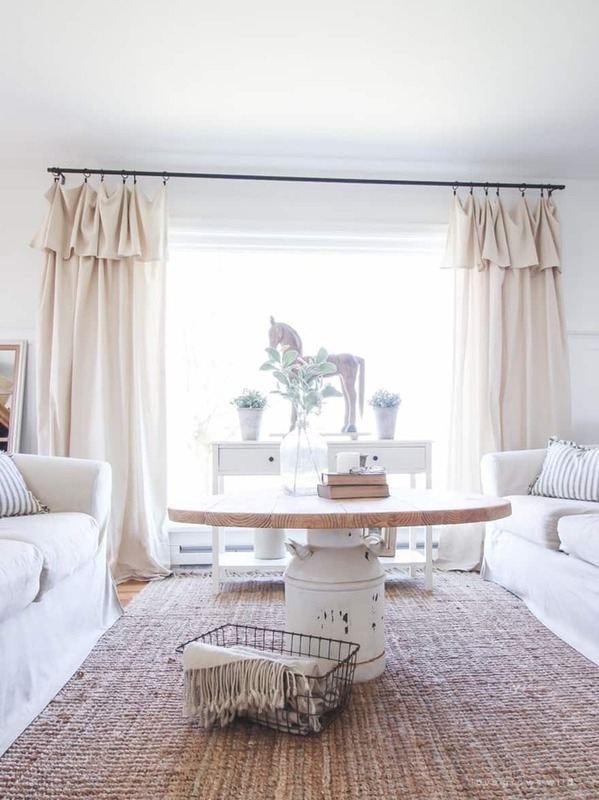 There is something sweet and romantic about farmhouse inspired interior design. 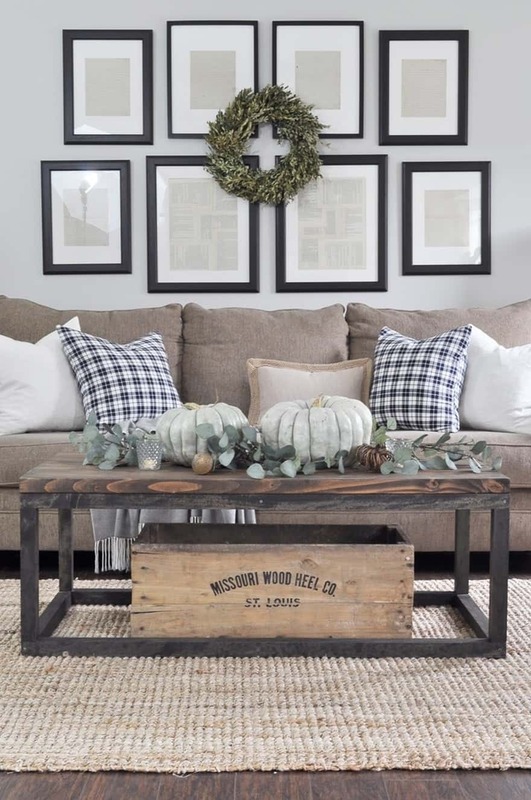 Rustic style puts a focus on natural materials and warm colors. 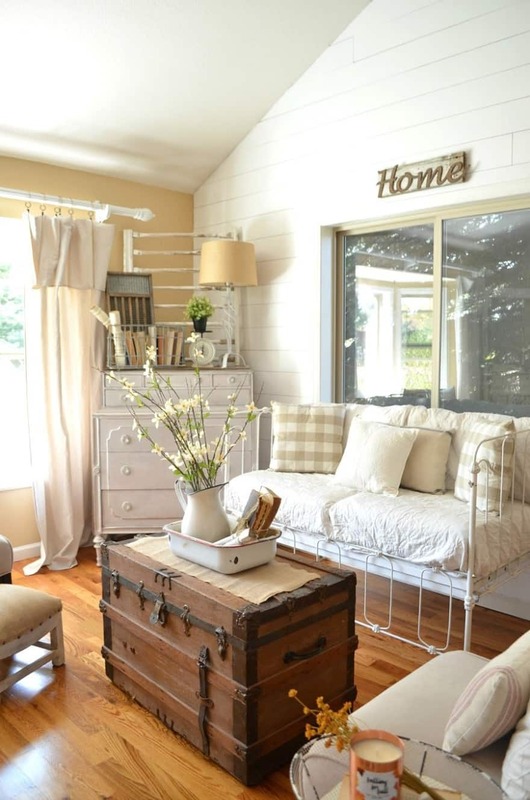 It cherishes weathered looks and shabby chic, which helps create truly unique and highly personal design solutions. Contemporary rustic style is all the hype today and it is certainly here to stay for a long, long time. 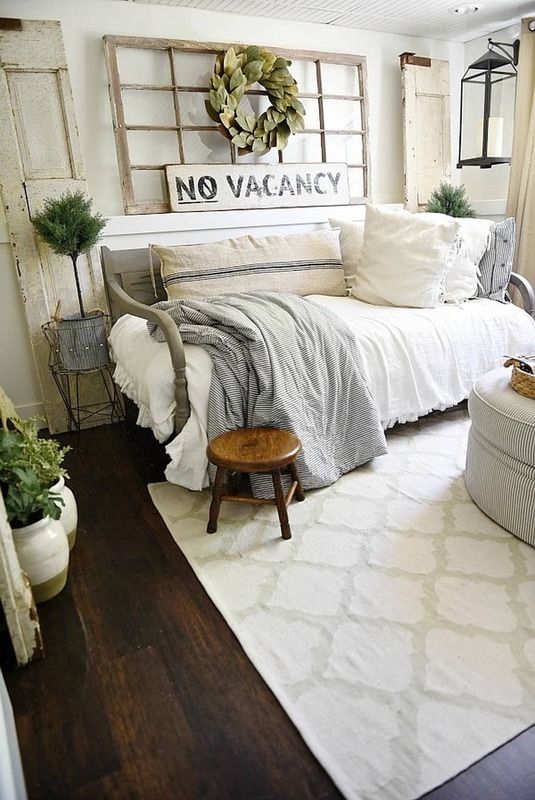 What should you bear in mind if you decide to redesign your home in a rustic way? First of all, do use natural materials such as wood, stone and natural fabrics. They are more expensive than their faux alternatives, but are so much more beautiful. 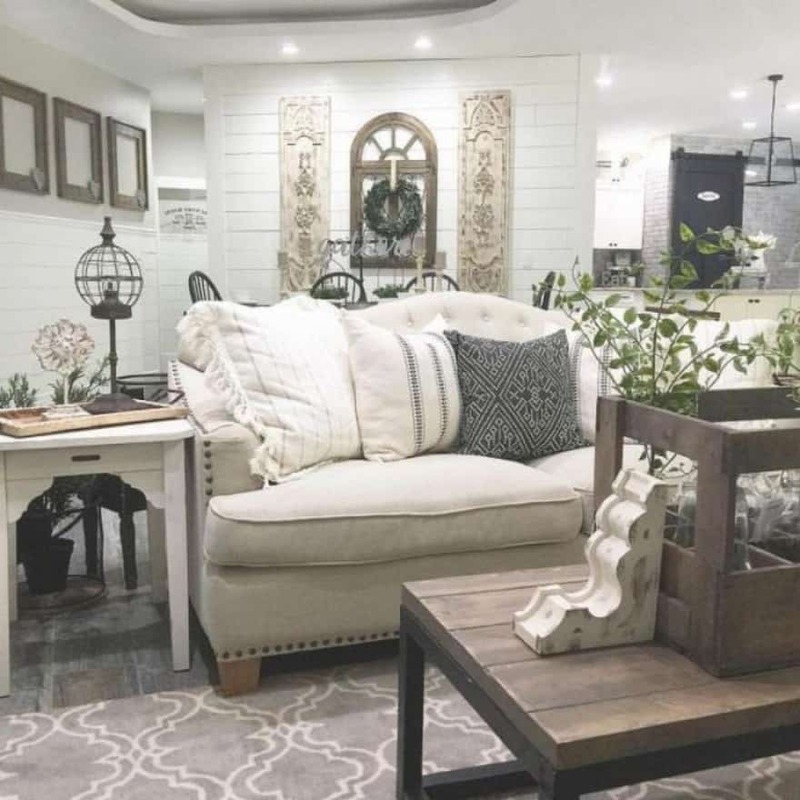 Plus, the great thing about rustic and farmhouse design is that you can easily make use of cheaper salvaged or second-hand materials – rustic design doesn’t have to be perfectly refined. There’s something special about weathered and imperfect materials that come with their own history. Opt for a color palette in warm earthy or neutral shades. 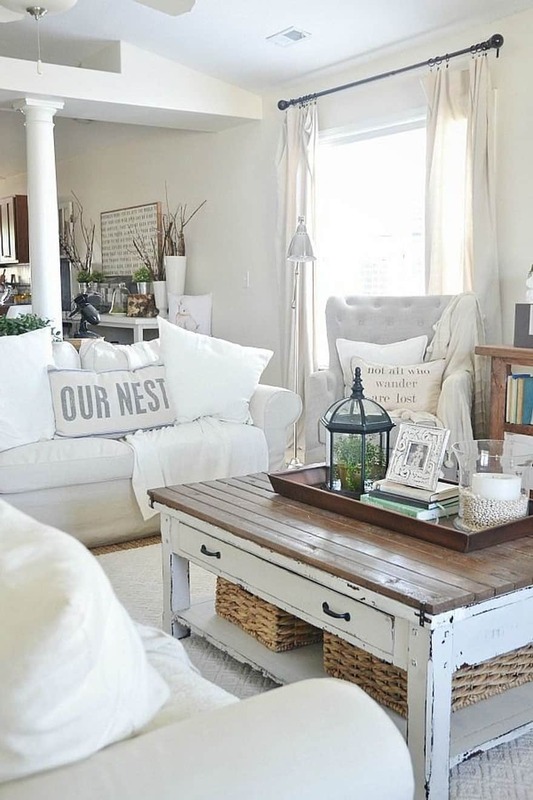 Off-whites, greys and browns are a great color choice for a farmhouse inspired living room design. You can add a dash of color to make your design more exciting – color pops can sometimes make all the difference and help you go from bland to grand. Of course, you may choose to stay more neutral and monochrome. In that case, make sure you introduce more pattern and texture – mix and match different materials and finishes to create a more elaborate look. 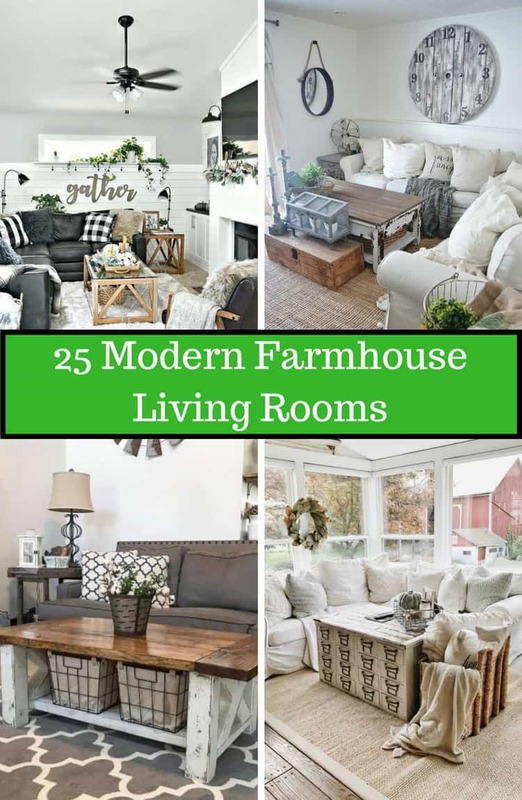 Now, take a look at today’s gallery which is full of inspirational rustic farmhouse design proposals for living rooms. 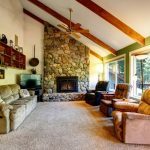 This sunroom/living room features large windows and vaulted ceilings. Its walls are painted white, and the floor is set in greyish hardwood. The room accommodates a comfy L-shaped sofa, as well as an apothecary table, both sitting on a linen area rug in light beige. 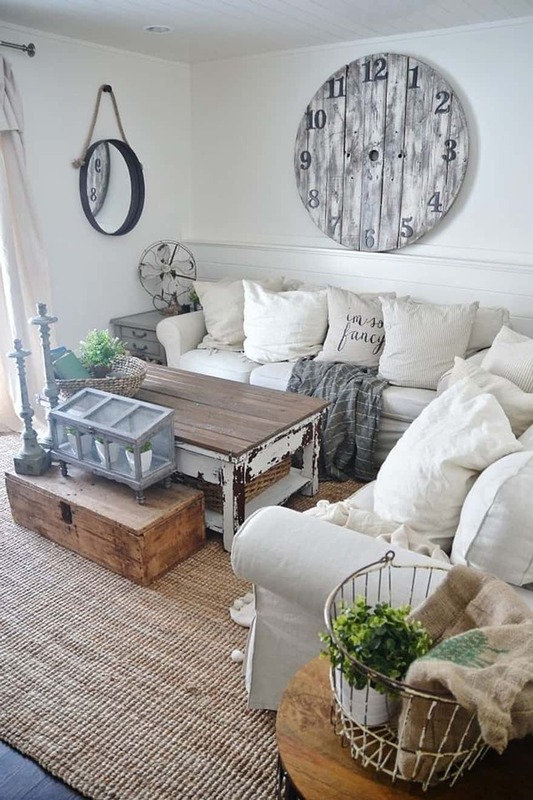 Here is another stylish rustic design in light neutrals. This one features a sitting area packed with two couches, an ottoman and a square coffee table. A patterned rug is laid on the floor and brings all elements together. 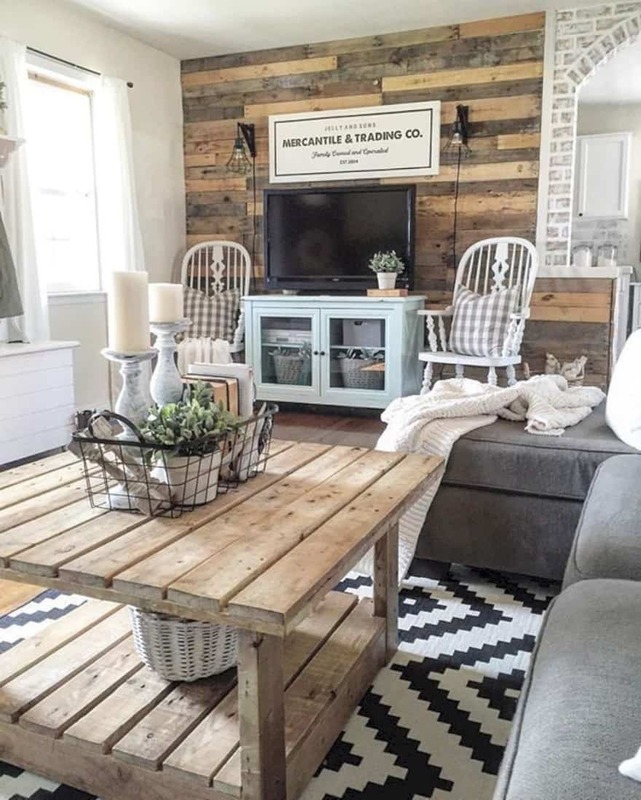 Here is a rustic design idea with a touch of modern. This design proposal suggests a black and white color scheme with a touch of wood. 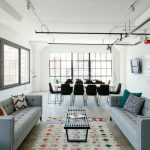 Furnishings include a black L-shaped leather sofa, a matching armchair and a pair of coffee tables. Here is a more romantic and dreamy take on farmhouse inspired design. This living room is set in soft pastels – eggshell, beige and ecru, that inspire a relaxed feel. The whole room is bathed in light coming through the large window. 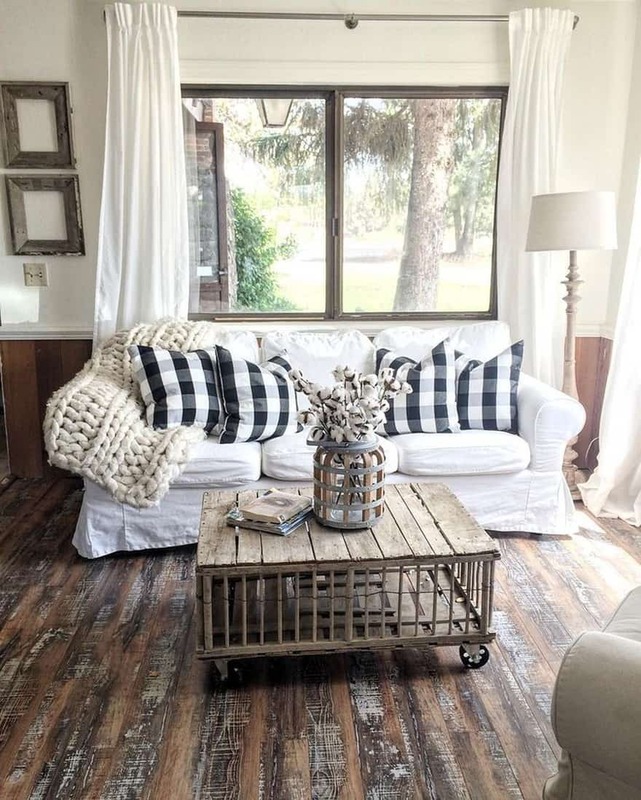 This rustic design is rich in texture and details. 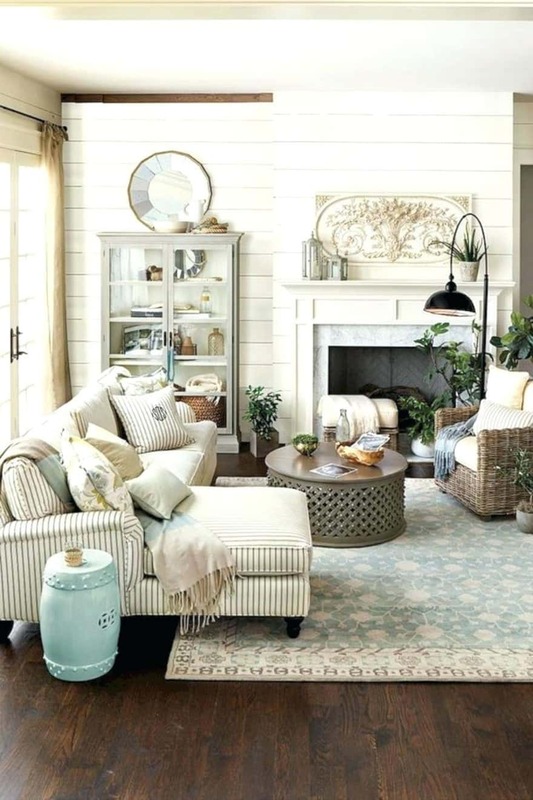 It features a striped L-shaped couch, a wicker armchair and a round table with a wooden grid base, all on top of a floral patterned area rug in pastel colors. 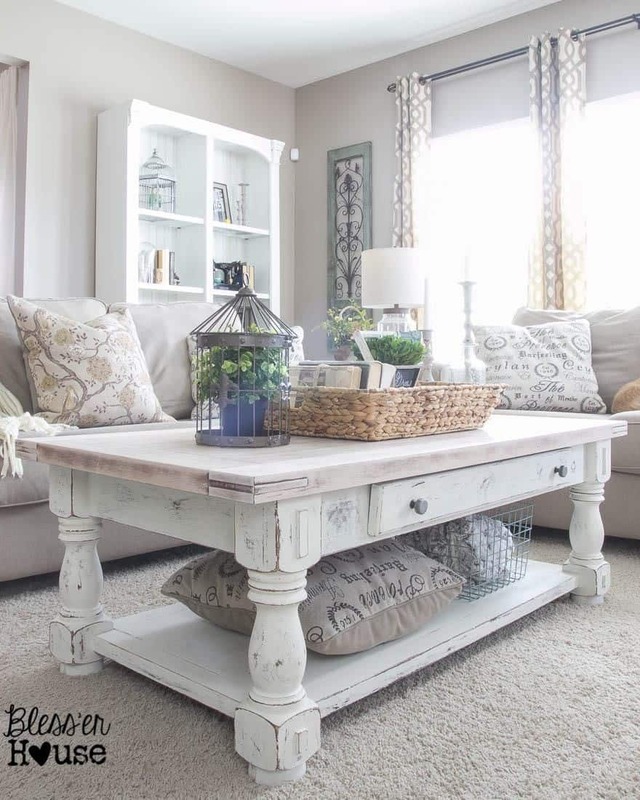 Here is a farmhouse inspired design with a touch of shabby chic. 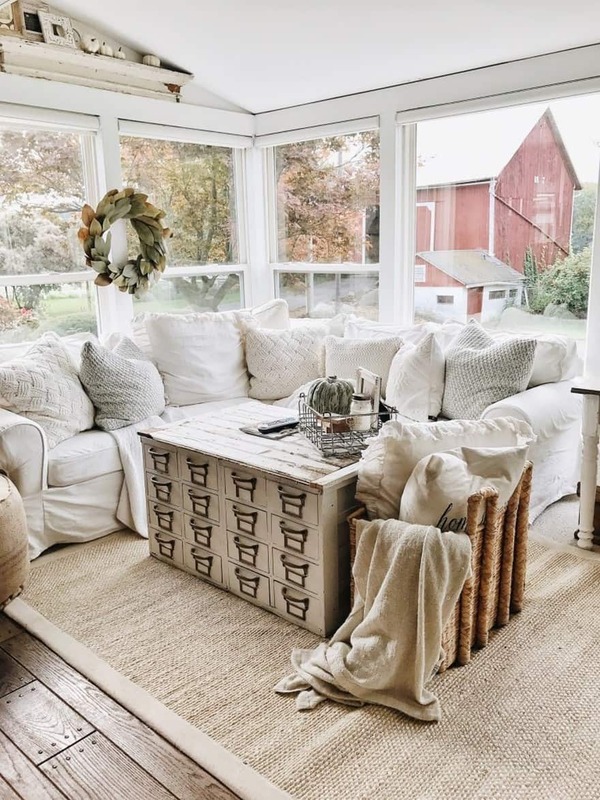 This design proposes a sitting area with couches and an armchair placed around a worn wooden table that certainly adds more character to the whole setting. 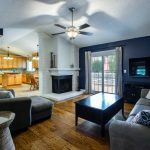 This cozy house has an open concept floor plan with one large multifunctional space that accommodates a family room area, a dining area and a staircase with a hallway area. The design is based on light neutrals that mix in together perfectly. Here is another rustic design. 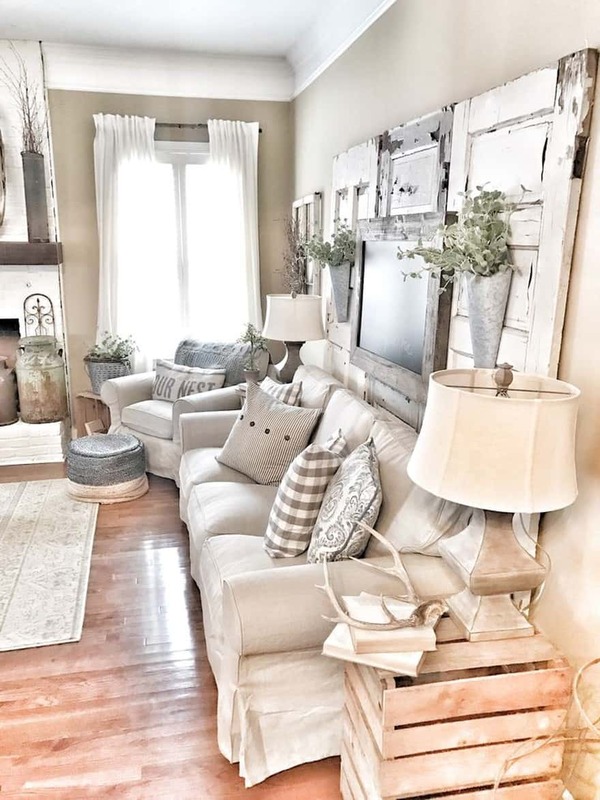 The creative use of old worn out door panels as an accent decor piece behind the sofa is a subtle flirt with shabby chic design and definitely makes the room one of a kind. 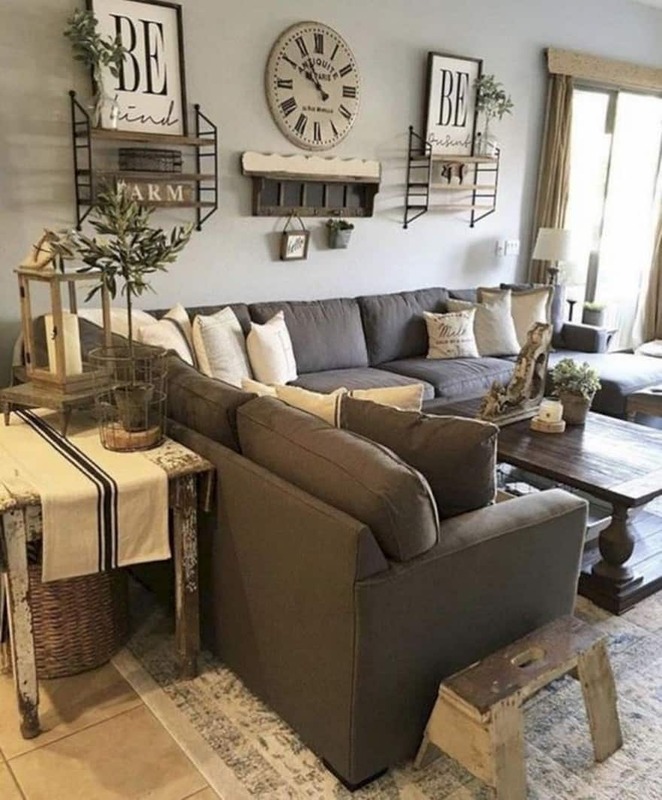 This design idea features a taupe colored sofa with a mix of patterned throw pillows on it, and a wood and metal coffee table. The wall behind the couch is nicely decorated with a whole bunch of black framed pictures. This design is rich in wood and packed with style. It features a three-seat sofa with checked black and white pillows and a woven blanket. It sits right in front of a draped window, with curtains coming down on both sides. 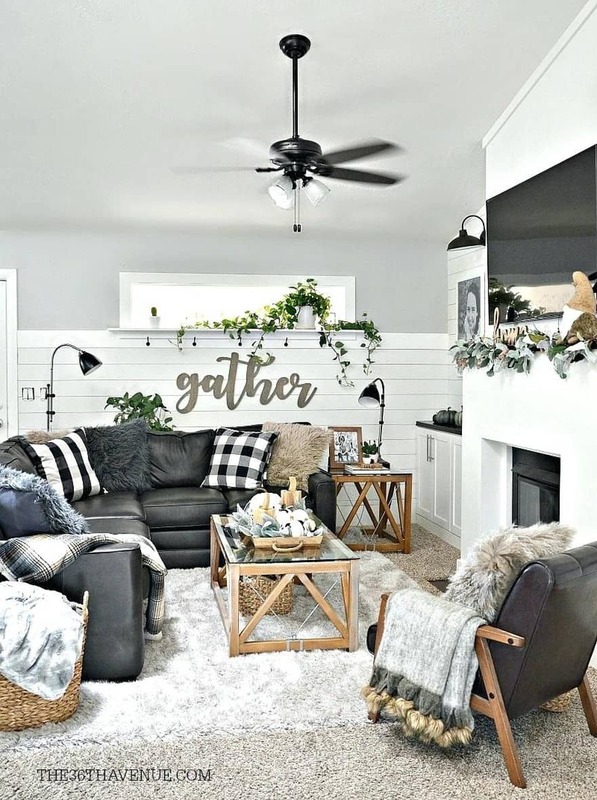 Here is another design that inspires a cozy feel. This living room corner accommodates a three-seat sofa and a coffee table made of wood. 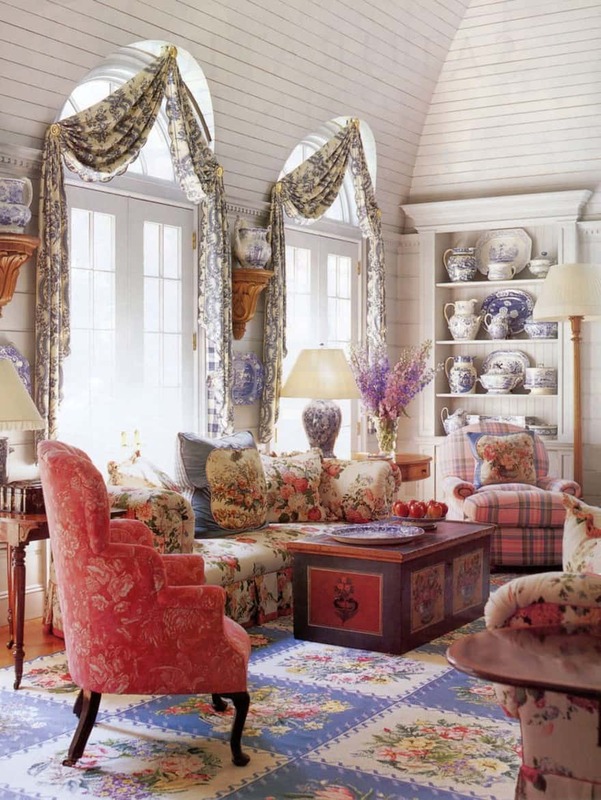 The patterned carpet is a nice match to the throw pillows that are of a similar design. This open concept living space unites the kitchen with the dining and living room areas. It also features a bar counter that visually separates the kitchen from the living room, but also makes a great anchor point for the whole family to gather round. 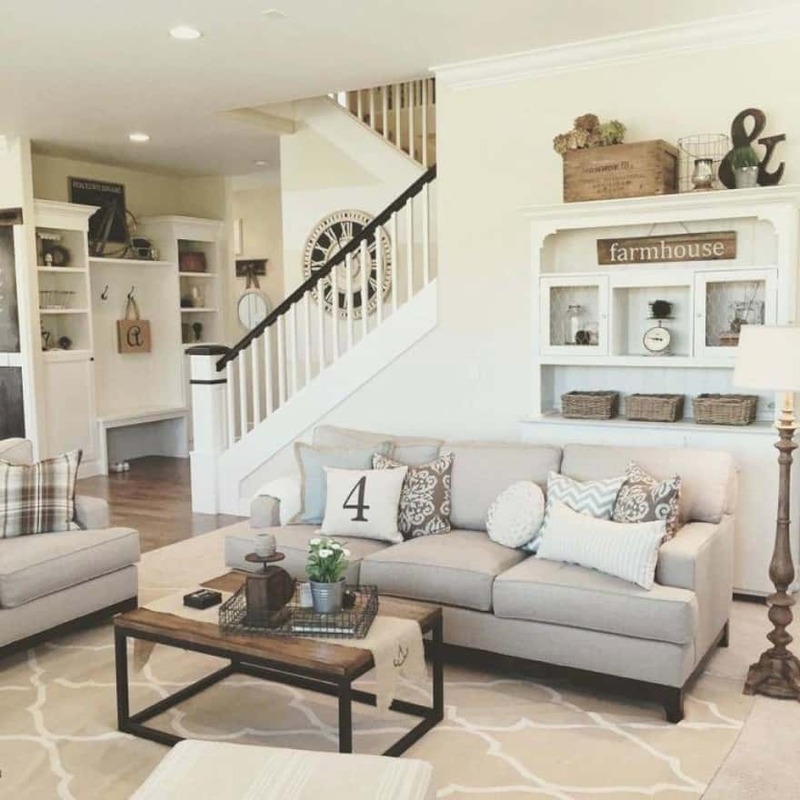 This living room is set in warm beige, taupe and brown hues. It features a large U-shaped sofa with a whole bunch of throw pillows and a coffee table. 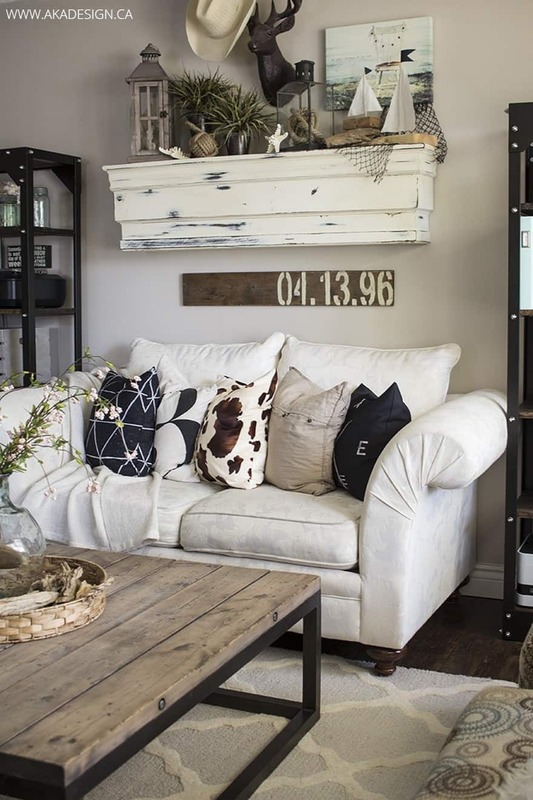 The wall shelves behind the sofa are a nice touch and can hold various decor pieces. This fabulous design has modern rustic feel to it. 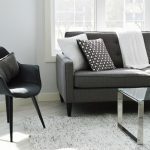 The beautiful couch is nicely decorated with a variety of throw pillows, and has an end table to the side, which is a nice and practical touch. 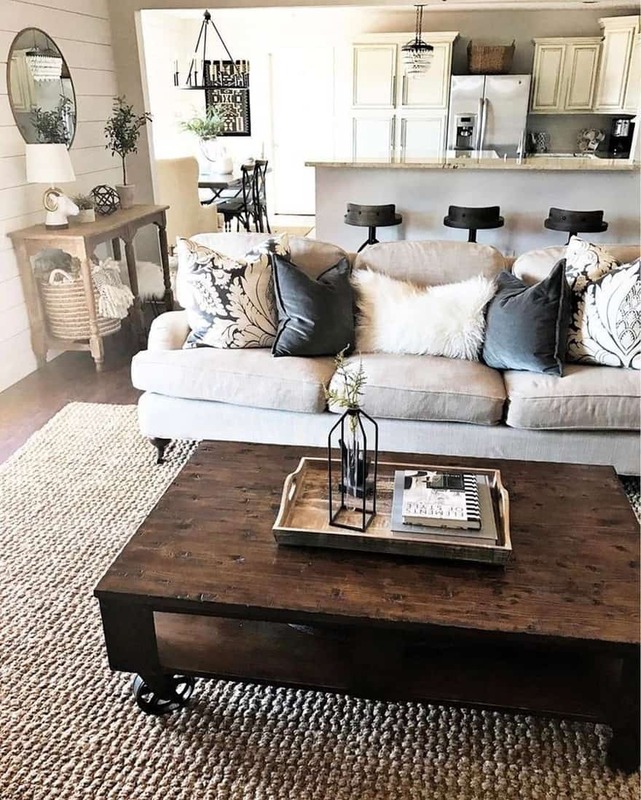 This shabby chic living room features an L-shaped sofa, a weathered coffee table, a pair of end tables and a large area rug. The room is nicely decorated with a different types of accent pieces – an enormous wall clock, a round mirror, a metal basket and many others. 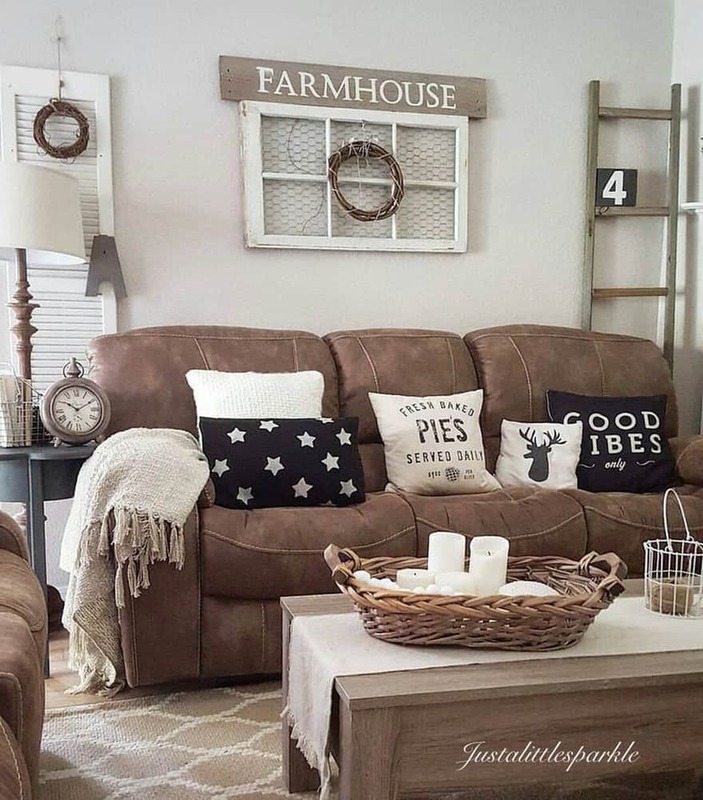 Here is another cozy rustic design. It features a wooden couch with large pillows, an ottoman table and a cute little wooden stool. A large area rug in light beige is laid on top of the dark hardwood floor, so it really pops out. 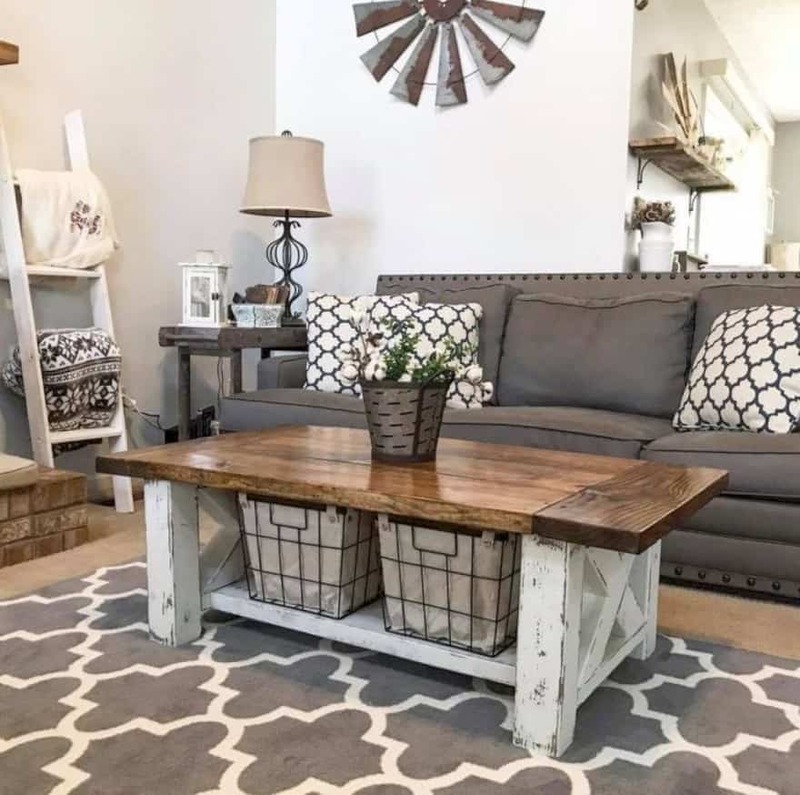 This farmhouse inspired design proposes a mix of various seating options scattered around a large wooden chest turned into a coffee table. The beautiful hardwood floor here is left exposed, without an area rug to cover it. This beautiful design feels nice and cozy. It features a set of beige colored couches with a weathered coffee table and a large soft carpet underneath. The walls are painted in light beige and the window is draped with an elegantly patterned curtain. Here is a fabulous design with an eye-catching wood-laid accent wall. The floor is also set in hardwood. The room is furnished with a grey sofa, a wooden table, a TV cabinet and a set of two rocking chairs. Here is a more eccentric farmhouse inspired design. It’s a real color feast in red and blue, with floral patterned fabrics and houseware. The room features a comfy sofa, two armchairs, a coffee table and end tables, and a large carpet on the floor. 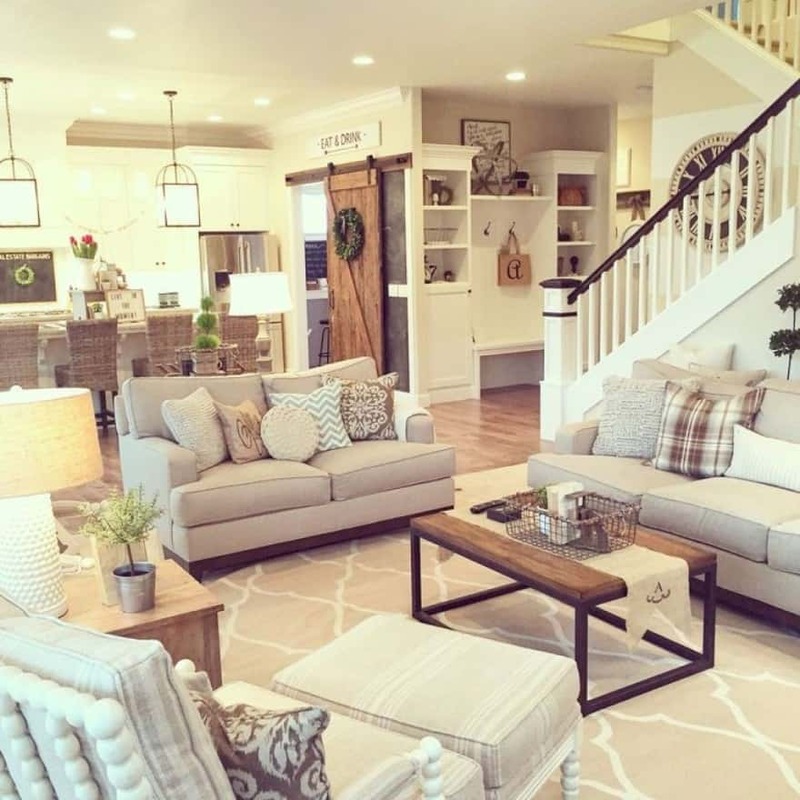 This design is on the safe side with a neutral color scheme in beige, brown and grey. 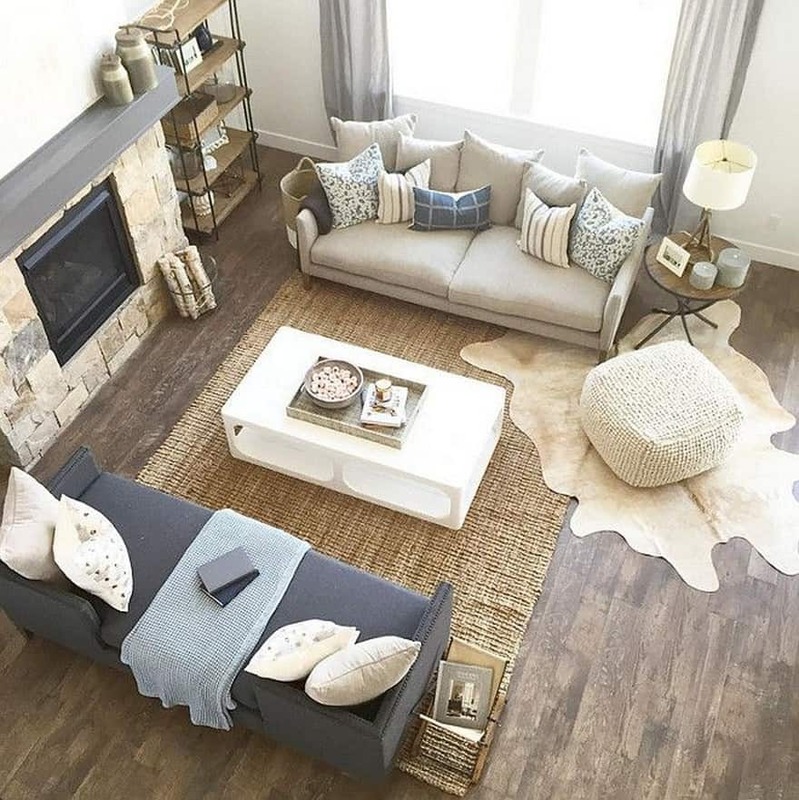 It certainly feels quite cozy and, the layered rug idea is all this design needs to go from dull to dazzling. Here is another proposal in warm shades of beige and brown. It features a brown sofa with a fun mix of throw pillows. The back wall is finely decorated with a curious selection of pieces – a step ladder, a window blind and a window frame. This living room is furnished with a pair of armchairs with a wooden table in between. 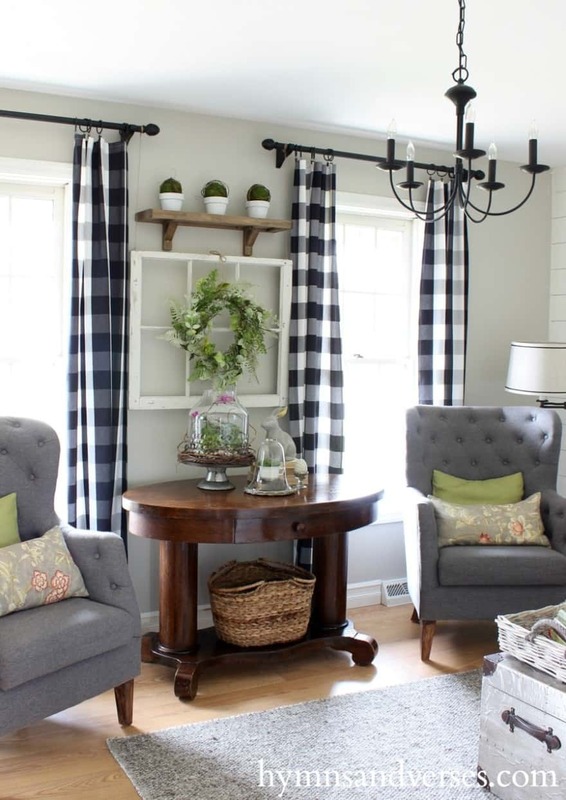 The windows are finished with checked curtains in black and white that add a touch of texture to the mix. This living room features a sofa with a bunch of pillows, a coffee table to the front, and a carpet underneath. The back wall features a wall shelf that holds a fine selection of accessories and decorations. This living room with vaulted ceilings and large windows feels spacious and bright. It is also packed with style. It features a large cabinet built around the fireplace, and a sitting area complete with a set of comfy couches.